From booth strategies to shoes, here’s what our team suggests for making the most of the show floor! We at iSEE have more than 80 NACS Show trips under our collective belts. Over the years, we’ve gathered some tried and true strategies for exploring, networking and thriving on the more than 400,000 square feet of expo floor. Besides the obvious pointer of coming to visit the iSEE team at Booth #2063 for new convenience merchandising tools and exclusive retailer discounts, here’s our top tips for the 2018 NACS Show! Do Your Homework: If there are booths you want to see and people you want to visit, try and schedule a visit before you get to Vegas. It gets very chaotic once the show starts. Look For Innovation and Trends: Every few years there is a wave of category and product trends you can spot on the expo floor. Keep an eye out for innovators – both retailers and suppliers. These are the folks who will be pushing the industry forward. Get to know them. Map It Out: It’s not a bad idea to map out the booths you want to see so that you can have a gameplan of which booths are close to each other (vs. hauling back and forth across a VERY large expo foor!). Benefit From Getting Involved: While the show floor can feel overwhelming at times, there are multiple other events (NACSPAC, Hunter Club, etc.) that allow for a more intimate networking. Boost Your Card Collection: After talking to a new contact, take a couple minutes to jot your notes down on their business card. Then you have their contact info and what you discussed all in one spot. 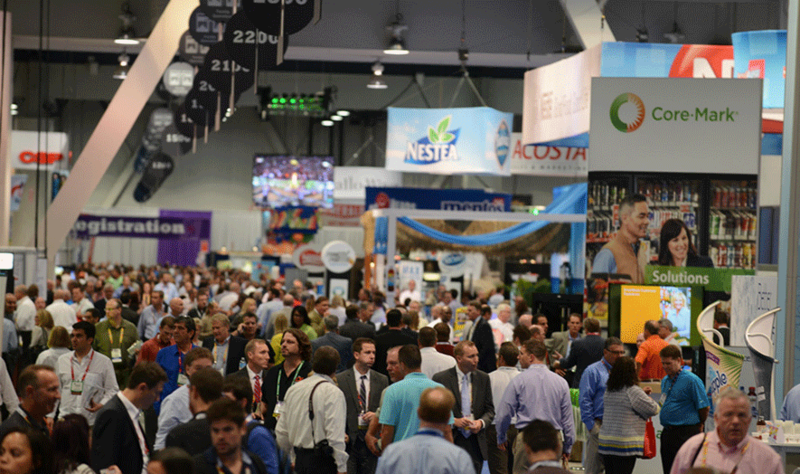 Enjoy The Eats: Don’t charge lunch to your expense report, there’s plenty to eat at the show. Consider it research on the blossoming foodservice category – and it usually tastes better than the food you buy at one of the stands! Get Strategic On Samples: The last day is the best time to score all the free stuff. People don’t want to bring their goods back with them. Hydrate, Hydrate, Hydrate! : Especially in the Las Vegas heat…and even more so if you’ve had a late night out enjoying the Vegas nightlife! Comfort Is Key: You’re on your feet all day on the hard convention floor so the wrong pair of shoes can really make or break the show for you. It’s not a bad idea to have a pair of sneakers or other comfy shoes nearby as a backup. Have Fun! : It’s the one time the entire industry gets together under one roof. Make some new friends and enjoy learning about what’s happening in this highly dynamic channel.